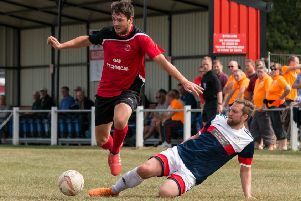 Satisfaction, tinged with relief, is the overriding feeling at Ollerton Town after another season of progress. Although their form has dipped since the turn of the year, Ollerton are on course to finish just below mid-table in their second campaign in Division One of the Northern Counties East League. And that will please manager Dave Winter, who admits he felt under pressure when it was suggested at one stage that the bottom five would be relegated. “We had to retain our status on Step Six of the non-league ladder to protect our bid for funding for ground improvements, “ Winter explained.